Dental implants are frequently used to replace single or multiple missing teeth, providing a durable, sophisticated and long-term solution. Consisting of a small titanium post inserted directly into the bone, dental implants provide a strong anchorage point for replacement teeth. Every implant procedure must be properly planned and treatment is likely to take several months to complete due to the need for the implant posts to heal or integrate with the bone. 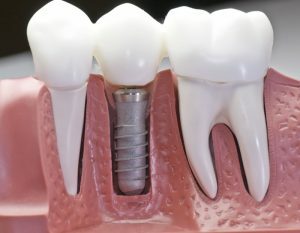 This is a highly skilled procedure, requiring an experienced surgeon to insert the dental implants in such a way to provide excellent functionality and aesthetics. Here at Newcastle City Dental, we will closely liaise with a trusted dental implant surgeon during your treatment and can provide the very highest quality restorative implants to complete this procedure. Our restorative dental implants include implant-supported crowns, bridges and full-arch bridges and dentures. What are Restorative Crowns and Bridges? Our restorative crowns and bridges are fabricated using only the very highest quality and most advanced materials. Each restoration is meticulously designed to blend in with your existing teeth, creating a beautiful yet natural smile. While excellent aesthetics are vital, we pay as much attention to ensuring your restorations are fully functional so that you can bite and chew food in complete comfort. What are Restorative Full-Arch Bridges and Dentures? Full-arch bridges and full dentures require particular care and attention to ensure facial dimensions are maintained and that facial muscles are fully supported. When fabricating these restorations, we liaise closely with our skilled dental technicians to ensure your full-arch bridge or implant-supported denture looks and feels natural while making it easy to eat properly. Full-arch bridges screwed or cemented onto the dental implants and can only be removed by a dentist. Implant-supported dentures click onto dental implants using special attachments and can be removed for easy cleaning.